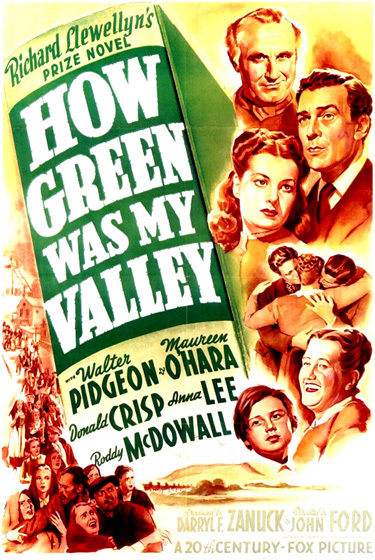 How Green Was My Valley (1941) is one of John Ford's masterpieces of sentimental human drama. It is the melodramatic and nostalgic story, adapted by screenwriter Philip Dunne from Richard Llewellyn's best-selling novel, of a close-knit, hard-working Welsh coal-mining family (the Morgans) at the turn of the century as a socio-economic way of life passes and the home-family unit disintegrates. Episodic incidents in everyday life convey the changes, trials, setbacks, and joys of the hard-bitten community as it faces growing unemployment, distressing work conditions, unrest, unionization and labor-capital disputes, and personal tragedy. Domestic life, romance, harsh treatment at school, the departure of two Morgan boys to find their fortune in America, unrequited love between the local preacher (Walter Pidgeon) and the only Morgan daughter (beautiful 19 year old Irish actress Maureen O'Hara), and other events are portrayed within the warm, human story. The remarkable outdoor set, with a row of houses sloping uphill toward the mine colliery, was convincingly realistic, although it was part of a set built in Southern California (the hills of Malibu). Originally, 20th Century Fox had planned for the film to be a four-hour Technicolor epic, akin to Gone With the Wind (1939), filmed on location in South Wales, but the war made that an impossibility. The Welsh tone of the film, from director Ford's recollections, is buoyed by Welsh Singers (vocalizing as themselves) performing much of the choral work. The film was nominated for a total of ten awards and walked away with five Oscars: Best Picture (Darryl F. Zanuck for 20th Century Fox), Best Director, Best Supporting Actor (Donald Crisp), Best Cinematography (Arthur Miller), and Best Art Direction. Its other nominations were for Best Supporting Actress (Sara Allgood), Best Screenplay (Philip Dunne), Best Editing, Best Score and Best Sound. The most controversial aspect of its Best Picture/Director win was that it defeated two of the greatest pictures ever made: Orson Welles' Citizen Kane (1941) and John Huston's The Maltese Falcon (1941). I am packing my belongings in the shawl my mother used to wear when she went to the market. And I'm going from my valley. And this time, I shall never return. I am leaving behind me my fifty years of memory. Memory. Strange that the mind will forget so much of what only this moment has passed, and yet hold clear and bright the memory of what happened years ago - of men and women long since dead. Yet who shall say what is real and what is not? Can I believe my friends all gone when their voices are still a glory in my ears? No. And I will stand to say no and no again, for they remain a living truth within my mind. There is no fence nor hedge round Time that is gone. You can go back and have what you like of it, if you can remember. So I can close my eyes on my Valley as it is today - and it is gone - and I see it as it was when I was a boy. Green it was, and possessed of the plenty of the earth. In all Wales, there was none so beautiful. Everything I ever learnt as a small boy came from my father, and I never found anything he ever told me to be wrong or worthless. The simple lessons he taught me are as sharp and clear in my mind as if I had heard them only yesterday. In those days, the black slag - the waste of the coalpits - had only begun to cover the side of our hill, not yet enough to mar the countryside nor blacken the beauty of our village. For the colliery had only begun to poke its skinny black fingers through the green. I can hear, even now, the voice of my sister Angharad. Someone would strike up a song, and the valley would ring with the sound of many voices - for singing is in my people as sight is in the eye. Then came the scrubbing - out in the back yard. It was the duty of my sister Angharad to bring the buckets of hot water and cold. And I performed what little tasks I could as my father and brothers scrubbed the coal dust from their backs. Most would come off them, but some would stay for life. It is the honorable badge of the coal miner - and I envied it on my father and grown-up brothers. Scrub and scrub, and Mr. Coal would lie there and laugh at you. In the Morgan kitchen/dining room for the evening meal, Huw is impatient to eat and eagerly reaches for a piece of bread. Restrained with playful frowns, the patriarchal Morgan offers grace at the head of the table - his lips move. At the table with bountiful food, Mr. Morgan carves the meat and Angharad serves soup. A rule was obeyed and observed during meals: "There was always a baron of beef or a shoulder or leg of lamb before my father. There was never any talk while we were eating. I never met anybody whose talk was better than good food." His gentle, wise and loving mother, Mrs. Morgan doesn't escape notice either: "My mother was always on the run - always the last to start her dinner and the first to finish. For, if my father was the head of our house, my mother was its heart." After dinner, when dishes had been washed, the box was brought to the table, for the spending money to be handed out. No one in our Valley had ever seen a bank. We kept our savings on the mantelpiece. My father used to say that money was made to be spent, just as men spend their strength and brains in earning it - and as willingly - but always with a purpose. Huw rushes from the house, respectfully slowing down in front of the Chapel ("Softly now, for Chapel was the first thing my father taught us"), and then running straight to Mrs. Tossall's Bakery and Confectionary Shop. Huw pauses outside and eagerly looks in the window of "the shop for that toffee which you could chew for hours, it seems to me now, and even after it had gone down, you could swallow and still find the taste of it hiding behind your tongue. It is with me now, so many years later. It makes me think of so much that was good that is gone." Huw is awed at the appearance of Bronwyn (Anna Lee), Ivor's fiancee, who is walking down steps with a double basket held by her hip and a pretty bonnet on her head: "It was on this afternoon that I first saw Bron - Bronwyn. She had come over from the next valley for her first call on my father and mother." Speechless, Huw falls immediately in love with her and gazes dreamily and wistfully at her: "I think I fell in love with Bronwyn then. Perhaps it is foolish to think a child could fall in love. But I am the child that was, and nobody knows how I felt, except only me." Bronwyn and Ivor were to be married by the new preacher, Mr. Gruffydd (Walter Pidgeon), who had come from the University at Cardiff. This was my first sight of him. With the preacher's entrance, Angharad takes a sudden interest - and like Huw with Bronwyn - instantly falls in love with him with an adoring gaze. At the conclusion of the ceremony, celebrants line the steps singing and tossing rice at the couple, as the Chapel bell rings. The interior of the Morgan household is filled with the happy wedding guests - a wide-eyed Huw watches from the staircase as an enormous wedding cake is brought into the throng of people. Outside, beer gushes from an opened tankard. Everyone joins in vigorous singing - both Angharad and Rev. Gruffydd, isolated by the camera, burst into gales of laughter at each other. The echoes of happy voices will soon give way to the gradual collapse and disintegration of the idyllic vision and simple way of life and its tragic breakup over a fifty year period. the shift for all labor in this mine. Huw's old-fashioned father reacts non-chalantly: "Come on, boys, back to work." Mr. Morgan thinks "this is a matter for the older men" - accompanied by two older miners Dai Griffiths and Idris John, he consults with the mine manager and represents them as a spokesman. When he returns home, he is tensely confronted at the door by his sons - he tells them: "The cut is only a few shillings. There will still be plenty for all of us...It is because they are not getting the old price for coal." The eldest son Ianto explains the "real reason for this cut" - the workers from the closed down iron works at Dowlais "have come to the colliery, willing to work for any wage - so all our wages must come down." The sons fear further cuts, but their father disputes with them: "Nonsense, a good worker is worth good wages, and he will get them." To gain power and "stand together" to deal with the owners, the Morgan sons suggest "a union of all the men." Restoring mastery over his boys, Mr. Morgan rejects talk about the move toward unionization following the cut in wages, calling their ideas "socialist nonsense." Union, is it? I never thought I'd hear my own sons talking socialist nonsense...I have had enough of this talk. On a rainy day at the colliery, Mr. Morgan stands in the pouring rain, checking out the trams with their loads of coal. He makes a check mark and waves one son's tram past. In another dinner scene, now tense and silent, Davy suddenly jumps to his feet, angered that his father is being humiliated by the mine owners: "Do you think I will let them make my father stand like a dog in the rain and not raise my hands to stop it?...This matter is too important for silence. They're trying to punish you...But what are we going to do about it? You will die of the cold when it comes to snow." Ianto pipes up for worker solidarity: "Let us all stand together and see how they will act, then." The authoritarian Morgan steadfastly refuses to succumb to their political agenda and will tolerate no more discussion: "You will not make me a plank for your politics. I will not be the excuse for any strike." The older sons Owen, Young Gwilym, Davy and Ianto stand and challenge their father, leaving him isolated at the table. Only Huw, the youngest, remains at the table with his father and loudly indicates (by clearing his throat) that he hasn't deserted him. His father finally acknowledges the impotent yet admiring presence of his dutiful son: "Yes, my son. I know you are there." The five sons move out of the house because of the disagreement, finding other lodging accommodations in the village. Twenty-two weeks the men were out, as the strike moved into winter. It was strange to go out into the street and find the men there in the daytime. It had a feeling of fright in it. And always the mood of the men grew uglier as empty bellies and desperation began to conquer reason. Any man who was not their friend became their enemy. They knew that my father had opposed the strike and now it was they who opposed him. I have come up here to tell you what I think of you all, because you are talking against my husband. You are a lot of cowards to go against him. He has done nothing against you and he never has and you know it well. How some of you, you smug-faced hypocrites, can sit in the same Chapel with him I cannot tell. To say he is with the owners is not only nonsense but downright wickedness. There's one thing more I've got to say and it is this. If harm comes to my Gwilym, I will find out the men and I will kill them with my two hands. And this I will swear by God Almighty. His legs were frozen to the bone. A year, two years, quiet like that. But I can't promise that he'll ever walk again. Nature must take her course.